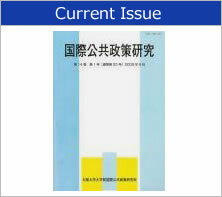 The purpose of this association shall be to contribute to the development of international public policy studies through promoting intellectual exchange among association members in relation to international public policy among association members as well as supporting research education in Osaka School of International Public Policy, Osaka University. The Association of International Public Policy Studies invites you to summit your article to the “International Public Policy Studies (Vol. 24, No. 1).” As announced, as of Vol. 21, No.1, the submission as a non-refereed article is no longer accepted and all submissions are reviewed by a referee. In conjunction with the renewal, the submission policy, membership fees, and submission deadlines are all changed. Please check here and submit your article and other required documents by the deadline. Copyright © 2015 The Association of International Public Policy Studies, Osaka University All Rights Reserved.